Garage doors were traditionally made from wood since it was widely available and easy to work with. But that is not the case today,with people having discovered other material with from which these doors can be made. While it may look like choosing a garage door is primarily dependent on the aesthetics and price, other important factors like location, the driveway, personal taste and insulation for noise among others should be considered. With these factors in mind, you not only get to buy a good door but also get real functionality for a long time. People who live in coastal areas should avoid buying wooden and steel doors since they will get corroded by the salty humid air. While many technicians will advise painting steel and wooden doors to keep the harsh weather out, it’s important to note that the cost of repeated painting can be higher than the cost of getting a door made from alternative material like fiberglass which is resistant to sea water corrosion. That is precisely why technicians from perfectsolutionsgaragedoor.com will insist that you get a door that fits the weather and climate of your location. If you need your garage door to be able to keep the outside noise out, you will want to get a wooden or wood composite door. This is particularly important for the men whose garage doubles up as their ‘man cave’. Steel and aluminum doors are poor at keeping sounds out. People with young kids are likely to use their driveway for games, for example like a basketball half-court. If you have kids playing in the driveway, you will want to have a door made out of sturdy material like wood. Doors made from steel tend to dent when they get hit by bats and balls as the kids play. Over time, the door becomes too dented you need to call a repairman to straighten it out. One can only straighten dents for so long before they have to replace the door. At the end of the day, it is your garage door that we are considering here. It’s only right that you pick a door made out of materials that appeal to you. People who like the traditional masculine style will tend to prefer wooden doors over other materials. On the other hand, people with a more modern taste will go for high-grade fiberglass for their doors. When choosing the material, it is a good idea to call your construction supervisor to know how the material will affect the overall structural integrity of the garage. Some materials like heavy wood might compromise the integrity of the structure. 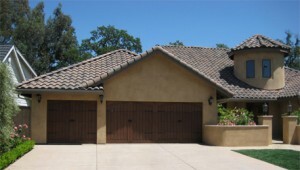 The above tips should hopefully guide you when you are choosing material for your garage door. Remember, at perfectsolutionsgaragedoor.com are always ready to help you with any questions that you might have about the choice of garage door materials. When faced by uncertainty, don’t hesitate to ask us. This entry was posted in Blog and tagged Garage Door Material. Bookmark the permalink.